JLG Lifts - Scissor Lift, Aerial Lift, Boom Lift – Kelly Tractor Co.
JLG electric powered aerial work platforms feature longer runtime, greater uptime and higher productivity. The energy efficient electric drive boosts your productivity with industry-leading duty cycles. The efficient machine design means less scheduled service, a quieter work area, less dependency on hydraulic oils, and zero emissions. From job start to completion, 12 ft to 60 ft, scissor lift, boom lift or mast lift, JLG has an electric lift to meet your needs and keep your job green. 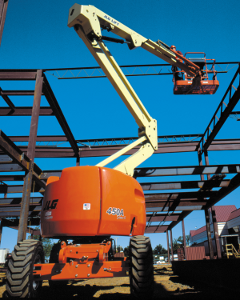 Kelly Tractor Co. provides rentals, leasing, sales and servicing for all types of JLG aerial lifts. We also offer JLG lifts for export and a complete line of JLG parts. We offer JLG lifts sales and rental for in the following Florida counties: Broward, Charlotte, Collier, Hendry, Glades, Indian River, Lee, Martin, Miami-Dade, Monroe, Okeechobee, Palm Beach and Saint Lucie. We also service the Orlando and Jacksonville markets for JLG equipment. Please contact us at (305) 592-5360 for more information.